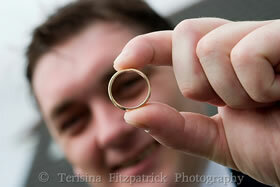 Terri provides reportage style wedding photography to couples across County Mayo and the west of Ireland. Based in Newport, most clients tend to be in the Achill Island, Mulranny, Newport and Westport areas but any practical location will be considered. As a recent bride herself, Terri is very well aware of the range and type of wedding images that a modern Irish bride will love. She is equally well aware of the emotions of the Big Day and offers a confident, reassuring and largely unobtrusive service, ensuring that all required shots are taken while always allowing the couple to enjoy their day. Terri has sourced the finest wedding albums available on the market. Italian albums by both Mario Acerboni & Graphi Studio, are premium quality, and the Australian handmade Jorgensen Albums give customers a more contemporary look to the traditional album. View a selection of Terri's wedding photography. This gallery is hosted by Picasa. All images can be enlarged and can be viewed individually or click the slideshow option to view in a slideshow. 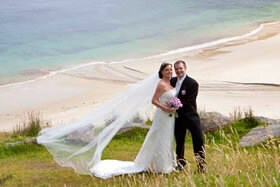 Get in touch for a no-obligation quote for your wedding photography.